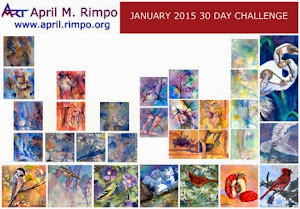 April M. Rimpo: "Fishing Day"
I grew up with a father who loved to fish. He didn't get to do it terribly often, but when he did he was the happiest I ever saw him. He either went out on a boat he owned with one of my uncles or went to a quiet spot, without the chaos shown here on this fishing pier. My mother's father was also a huge fisherman. He loved to fish on the Jersey shore, just standing on the shore in his waders. I heard so many times about his love of fishing and saw so many pictures of him that I feel like I saw him out there, but in reality I don't think I ever actually saw my grandfather at the shore. It's interesting how family stories become real images to us. 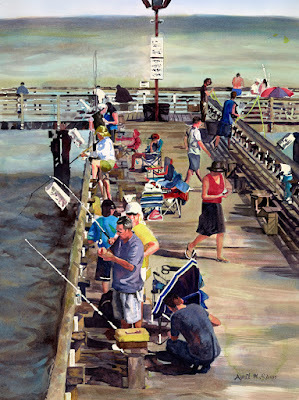 Although my family didn't fish off of fishing piers, I find the interaction and camaraderie on this pier mesmerizing, where fishing is almost a team sport. Fishing Day was selected from over 477 paintings submitted for this exhibition. I am honored the juror, Andy Evansen, selected mine. Creative ART Coaching - How did we get here?